At the start of the summer we decided to enter Sorella Sorella into the national English Italian Awards competition. At this point we had done some research on the awards but had no idea how big it actually was! 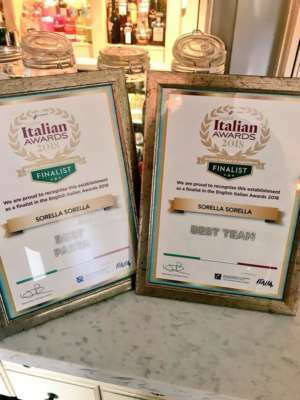 We entered the restaurant into four categories; Best Pasta, Best Team, Best Family Owned Restaurant and finally England’s Best ‘Cuoco’ of the Year. For us to get votes and get to the final, we had to turn to our customers to vote for us! This was through social media and promotion of various things around the restaurant. We found out in early September that we had been shortlisted to the finals out of hundreds of restaurants around the country for; Best Pasta, Best Team and England’s Best ‘Cuoco’ of the Year. We were ecstatic about this and very grateful to all of our customers who had took the time to vote for us! The next stage of the competition for Best Pasta and Best ‘Cuoco’ of the Year was a cook off at the Cheshire Cookery School in Altrincham. 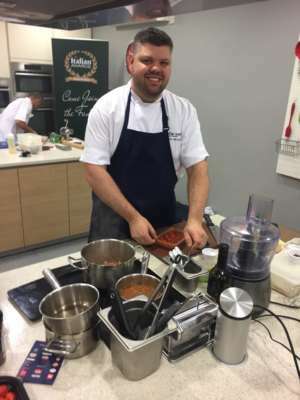 Our head chef, Chris, had to make two pasta dishes and a dish of his choice which were timed and blind taste tested by a panel of esteemed judges. Our other nomination for Best Team consists of mystery judges coming to visit our restaurant for a meal to look at how our team works. We then find out the results in Manchester at the awards ceremony on Sunday 7th October, which we are all very excited for. We are keeping everything crossed and would be beyond overjoyed if we won!